Below is an overview of our recruitment process. 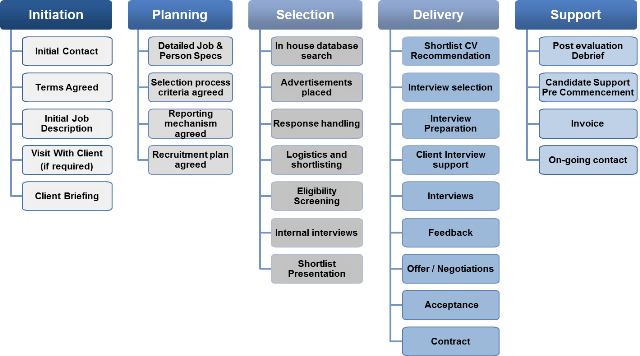 We have devised this process to ensure our Clients are fully aware of what is to be expected at each of the 5 stages in our Recruitment Methodology. Client briefing to understand the requirements of potential candidates and establish a recruitment plan. Understanding of the Role and Person Spec and outlining the recruitment plan. Role is advertised in accordance with the recruitment plan and candidates are invited to apply. All responses are handled and vetted before a shortlist is proposed. Support for both the Client in shortlist selection, interview support / preparation, feedback, negotiation and contract. Post evaluation debriefing and Client and Candidate feedback. Contract management for Interim appointments and final reports prepared.